UPDATED: Sun., March 4, 2018, 8:15 p.m.
BOSTON – From Virginia to Massachusetts, about 1 million people remained without power Sunday, two days after a destructive nor’easter, leaving some unsure when they could return home and schools unsure if they would open Monday morning. Skies were clear Sunday over much of the Northeast hit by the storm, which was blamed for nine deaths, including two children struck by trees. But many communities faced major challenges restoring power and cleaning up debris. 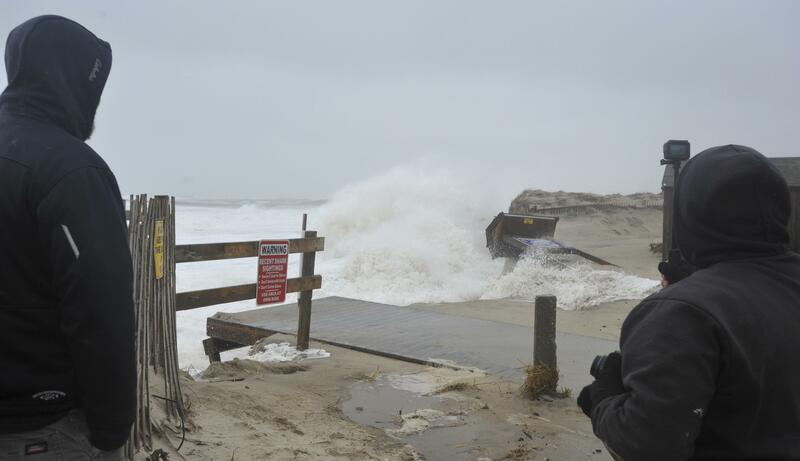 In Scituate, Massachusetts, a hard-hit coastal town near Boston, heavy construction vehicles worked to clear away several feet of sand that had covered roads near Peggotty Beach. Town officials planned to deploy a drone to help assess coastal damage. Farther north, Massachusetts Gov. Charlie Baker inspected storm damage in other battered coastal communities. While perched on a sea wall in Gloucester – something officials have urged people not to do – the Republican got soaked by a strong wave, WBZ-AM reported. As of mid-afternoon Sunday, more than 180,000 people remained without power in Massachusetts. More than 230,000 were powerless in Pennsylvania, and large-scale outages also continued in New York, New Jersey, Virginia and Maryland. In New Jersey, officials said some areas might not have their electricity restored until Tuesday or Wednesday. Among those affected was John Thompson, of Morris Township, whose family has been staying with in-laws. In the Philadelphia suburbs, the Lower Merion School District said one high school and one elementary school remained without power and would not open Monday unless it was restored. At one of its high schools with power, the district invited residents to charge their phones and take hot showers. New Hampshire was spared extensive power outages, but its short stretch of coastline was littered with debris. “We saw some of the worst coastal flooding since the ‘Perfect Storm’ back in 1991,” said David Cropper, owner of the Cinnamon Rainbows surf shop in Hampton. The surf remained high Sunday but there was no surfing because of strong winds. The Coast Guard warned of navigational hazards off Oregon Inlet in North Carolina’s Outer Banks after high winds and heavy seas swept about 70 containers off the cargo ship Maersk Shanghai late Saturday. The Liberian-registered ship had departed from Norfolk, Virginia, earlier in the day. The transportation disruptions caused by the storm were mostly resolved by Sunday. But North Carolina’s Highway 12 was closed in both directions along a section on Hatteras Island in the Outer Banks. As a result, the state transportation department said Hatteras and Ocracoke islands were temporarily inaccessible by land transport. Published: March 4, 2018, 1:39 p.m. Updated: March 4, 2018, 8:15 p.m.